Regardless of your location on the globe, you must know that liquefied natural gas (LNG) is growing in popularity at a very surprising rate. Experts are calling for a doubling of the worldwide capacity of this product by 2020. Many countries are already heeding to these calls, with reports of positive response in India, Europe among other regions. Surely, these kinds of developments will have an impact on how we handle power generation henceforth. History has shown that with increased energy demand, an even more enhancement for energy efficiency is inevitable. In looking for solutions for liquid gas generation, it is no wonder a lot of focus has been on mechanical drives for compressor trains. As you would expect, ARANER is in the mix of things. Turbine Inlet Air Cooling, a renowned technology associated with the company, is one of the most effective solutions LNG generating companies can adopt. When it comes to LNG plants using gas turbines to drive their compressor trains, the discussion mostly focuses on aero-derivative gas turbines. These devices are common in the plants because of their swift start up and excellent efficiency, characteristics that suit constantly changing demand. While still popular as mechanical drives, one problem still lingers- GT power output is reduced a lot for high ambient temperature. How do you guarantee high efficiency in hot climates. We seek to address this question in this post. The project company may control a number of issues, but feed gas cost ratio to LNG price ratio is usually out of question. Market forces dictate this one. Therefore, the project company has only one option remaining: manage thermal efficiency of the plant. Numerous factors influence thermal efficiency, including inlet pressure/temperature and gas composition. This is where the importance of controlling inlet air temperature comes into focus. And what is the technology of choice for modern LNG plants? The answer is Turbine Inlet Air Cooling, better known as TIAC. Gas turbine-driven compressor trains have always been subject to disdain because of their wanting on-peak performance. This is to add to other limitations such as high mechanical stresses, sensitivity and complexity among others. If your main concern is on-peak performance, then TIAC from ARANER is your ready solution. Hitherto, many people have related TIAC with mechanical chillers as used in power generation. Most users indeed came to know of ARANER through this technology. Another increasingly popular application is the Oil & Gas market, which is fueled by the need to reduce capital costs. To be specific, this is attributed to ambient temperature, which affects LNG production a great deal. The drive power of the refrigeration system is temperature-sensitive. Output drop of the mechanical drive can be as much as 30% for an ambient temperature rise of 20̊C (15°C to 45̊C). Since gas turbines are mass flow engines, their performance is a function of ambient air temperature in single-shaft varieties. Even in multiple-shaft aero-derivative gas turbines, volumetric airflow is largely considered constant. Therefore, using TIAC to stabilize or increase power output is acceptable. Using gas turbines for mechanical drive applications has expectedly been problematic in extremely hot climates because of the ambient temperature factor. The only significant way facilities in these regions can combat the ambient temperature challenge is through inlet cooling to increase output. ARANER’s application of TIAC in the Middle East and elsewhere has proven to be the ideal solution. The company’s expertise in the Petrochemical, Oil & Gas Industry blends well with the increased need for reliability, and compliance to strict international standards. TIAC is one of the best solutions ever for this industry because it improves the overall results of the plant. Constant power in LNG liquefaction plant is a priority. Other solutions, for example evaporative cooling system, may not offer this characteristic, but a TIAC system does so by allowing the gas turbine to enjoy a near perfect flow of inlet air. How is this important for operations? The move towards a greener future and market forces have made it necessary for LNG plants to pursue efficient operations. Gas turbines are worthy mechanical drives for the compressor trains in this industry, but high ambient temperatures degrade performance. For consistency in LNG production, TIAC is a good option. 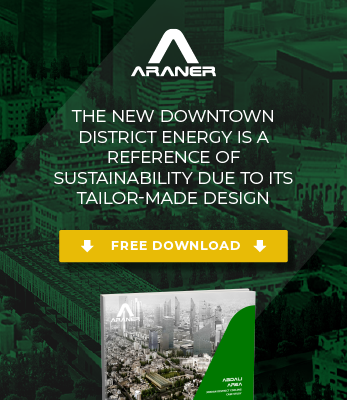 Get in touch with ARANER more about this technology’s applicability.